Be sure to first CLEAN the surface of the glass! You can use rubbing alcohol, a vinegar and water solution, or a glass cleaner to get rid of all the grease and dirt. You may also want to wear latex gloves while painting to avoid smudging the glass with oils from your fingers. Paint sticks much better to clean surfaces! You can use several different kinds of paint when stenciling on glass! The following are all durable paint products meant to withstand light hand washing with water and soap; do not scrub! Enamel Paint: FolkArt Enamel Paint is non-toxic and comes in a variety of vibrant colors and metallics. It also has a glossy finish. Acrylic Paint can be combined with FolkArt glass medium to create durable glass paint. This option requires the stenciled design to be heat set. Other options are using Frosting Varnish for a semi-permanent look or Etching Cream to permanently stencil your glass surface! 1. Whether you decide to paint your stencil with a dense foam roller or stencil brush, make sure that the applicator you use is completely dry. Any water added to the paint can mess with the adhesiveness of the paint! 2. Don’t overload your applicator with paint! You can always use several coats of paint after the priors dry. Otherwise the paint will bleed! 3. Wait until the paint is somewhat dry to remove the stencil. If you notice a smudge or mistake, use rubbing alcohol on a Q-tip to remove the unwanted enamel or acrylic paint! 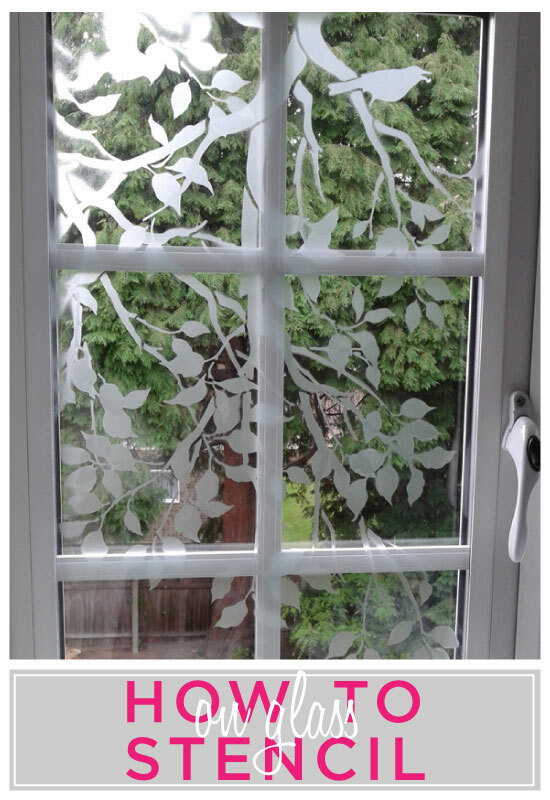 Do you want to stencil your glass home decor? Shop Cutting Edge Stencils for the stencil pattern that fits your home interior! Visit our Facebook Page to view customers’ photos for inspiration! Read our blog for more how to tutorials!